Guns N’ Roses guitarist Ron “Bumblefoot” Thal says he’s eager for the band to record and release some new music. "We're still doing shows, and I think once we clear our schedule and focus more on new music, it'll happen," Thal tells Rolling Stone. "We just have little things on the back burner, just waiting for the right time for us to organize and make something new out of it. Hopefully we can make more music – that's what it's about." “It's what the fans want, too,” he continued. “They want new music, and we can do it. It's not that we're done. I'm not ready for that. We need to keep making music. We have a great band that's ready to do it and can do it well." 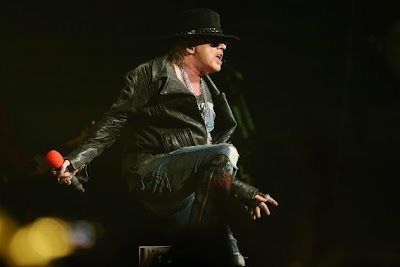 GNR’s last album was 2008’s “Chinese Democracy,” a project that was more than 15 years in the making; the band has been on tour almost constantly since its release. Thal is optimistic that eventually there will be new music to play. "Let's keep our fingers crossed that life will not get in the way and we can get this last batch of shows done,” he says. “Looking forward to it, but I'm also looking forward to having the main priority of our Guns time be making new music." Later this year, GNR will issue their 3D concert film, “Appetite For Democracy,” which captures the band during their 2012 Las Vegas residency at The Joint inside The Hard Rock Hotel & Casino.